Car ReviewsFind all of our car reviews in this section of the blog. We give you honest reviews of what we think about the latest model cars, mini-vans, hybrids and more! Summer is good for a lot wonderful and fun things. But for me, summer and wine go together like peas and carrots. But unlike those perfectly matched vegetables, my ideal of the summer and wine combo is found in our very refreshingly delicious Pink Moscato & Rum Berry Slush. This is not only a beautiful creation, but it is also a cocktail packing incredible flavor and character. 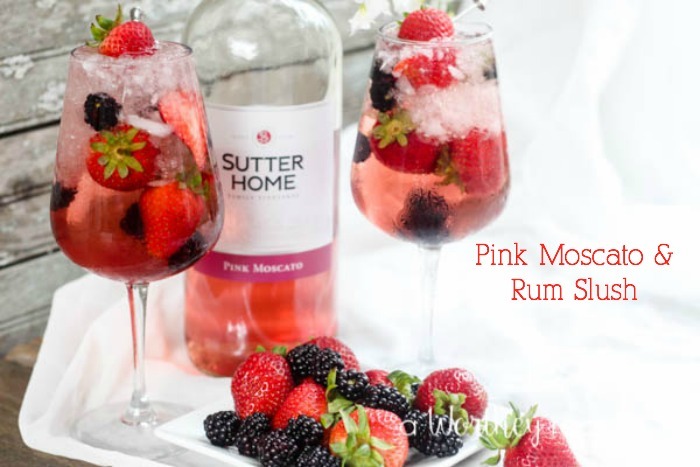 And with Sutter Home Pink Moscato easy cocktail creation is as effortless as falling down. We started with fresh strawberries and juicy blackberries. Then added a bit of ginger hibiscus simple syrup, a pour of spiced rum and a heavy splash of Sutter Home Pink Moscato. Then, the whole kit and kaboodle are poured over lots of crushed ice dotted throughout with fresh fruit. This is just one example why Sutter Home is the perfect wine for summer entertaining and those chill moments when a cool glass of wine is shared with friends (or by yourself) and a beautiful sunset. And the good folks at Sutter Home have been producing award-winning wine for over 65-years. Making good wine is in their DNA. Sutter Home puts the fam in family and the good stuff in the bottle. Whether you have been drinking wine for a while now or discovering wine, Sutter Home offers several excellent wine varietals to choose from and at an affordable price. So, whether you are entertaining guests, the Pink Moscato is an ideal pairing. Serve it chilled or as the main ingredient in our Pink Moscato & Rum Berry Slush cocktail. So tell us, what is your ideal way to enjoy wine? With dear friends and great food or sipping and reading a good book? Please share and we’ll promise to keep it a secret. Get the delicious and refreshing recipe down below. In the bowl of a wine glass add three fresh strawberries and three blackberries. Pour in the hibiscus ginger simple syrup. Next, add a good quality dark spiced rum. Top with lots of crushed ice, pour in the delicious Sutter Home Pink Moscato and slightly mix with a long-handled stirrer stick. Add more fresh fruit and garnish with a fresh strawberry. For more great recipe ideas using Sutter Home products, be sure to head over to their website for more great ideas! Oh my goodness, does this sound fabulous! Perfect for summer entertaining. This looks so good and refreshing! I know it always matters how well a drink tastes, but this one is pretty too with all of the bright colors. Where do you get hibiscus ginger syrup from? This looks so good! Thank you, Alicia! We picked up the hibiscus ginger syrup from our local Home Goods store! But You should be able to find it online as well! Thanks again! Copyright © This Worthey Life/A Worthey Media, All Rights Reserved.